From left, Frost Manor administrator and director of care Doneath Stewart and family members Lisa Hughes and Pat Finney pose with the home’s new robotic cats. Thanks to a generous donation from two family members, Frost Manor residents are enjoying the company of some new furry friends. 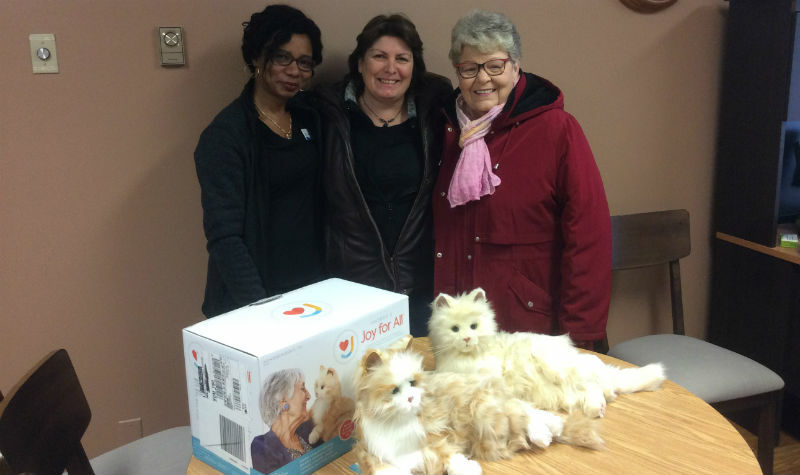 In December, Pat Finney and Lisa Hughes dropped by Frost Manor to deliver two robotic therapy cats to the Lindsay long-term care home, and the felines have been having a positive impact on residents, says life enrichment co-ordinator (LEC) Lyndsay Burton. Frost Manor resident Viola Quibell and RN Nancy Pearce are seen here enjoying one of the home’s new robotic felines. 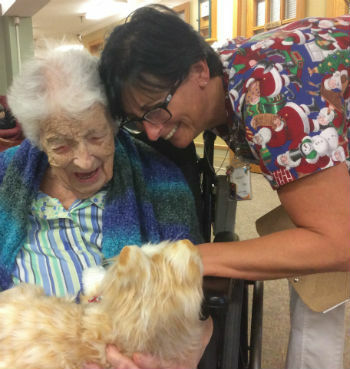 Robotic cats and dogs have become fixtures in long-term care homes in recent years. The fur on the life-like animals feels realistic, they meow, have heartbeats, and they can move their ears and eyes. They also respond to being touched and petted. There is one small matter up for debate about the robotic cats: what to name them.